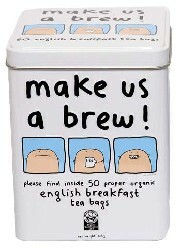 Make Us A Brew! tea caddy with organic tea bags! the official make us a brew! tea caddy, featuring mr scruff's quest for the perfect brew. complete with 50 proper organic english breakfast teabags - the jewel in our tea cupboard - full-bodied, malty and a fantastic brew at any time of day.